Marketing your school does not have to be expensive. 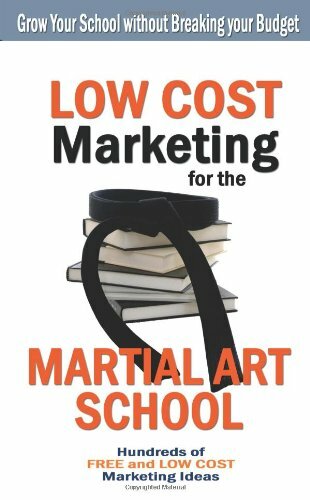 The Marketing chapter of the Low Cost Marketing for the Martial Art School gives you 100s of ways to recruit new students and retain current students with little or no cash expenditure. If you implement even one third of the ideas over the course of the next year, your school will grow and thrive like never before. Below are 10 sample ideasto get you started. 2. Create a Product Display. A product display can be as simple as pinning up patches, headbands and pins on a bulletin board or as complex as furnishing a glass display case. The important part is how it looks. Use your imagination to create a low cost display of the supplies and equipment students can buy at the school. If you have time, create monthly themes in your display. Be sure to include item names, descriptions, sizes and prices. And don’t forget to secure the items (or permanently mark them in some way) so they don’t “walk away. 3. Have a free giveaway. For example, everyone who drops by to tour your school and pick up information receives a free headband, key chain, sticker, trading card, poster or patch. The gift does not have to be expensive, especially if the recipients are children. 4. Reward referrals. Make a policy to reward student and parent referrals. When a student brings in a friend or relative to sign up, give the student a gift of appreciation, such as a t-shirt, sparring equipment or a hand held target. As an added incentive, give a small gift to the new student as well. 5. Create a tie-in with another business. Contact a local business and offer to exchange coupons. For example, your students receive coupons for a discount on martial arts video rentals at the local video store and the video store gives their customers free trial lesson coupons. Tie-ins work well with video stores, restaurants, arcades, bowling alleys, movie theaters and other recreation businesses. A great place to start is with students or parents from your school who own businesses. 6. Make your waiting room “parent friendly” with a place for younger brothers and sisters to play and a comfortable reading area for parents. A play area can be as simple as a few child size chairs with a table. Ask junior students to donate suitable toys that they no longer use. Remember to inspect the toys for small parts that might be swallowed or sharp edges that toddlers might injure themselves on. For parents, purchase some comfortable folding chairs and perhaps a writing table for those who bring work to do. 7. Make copies of news articles about yourself and the school. Hang them on the walls or pass them out. Past publicity is better than any advertising or promotional literature you can create. Give copies of positive articles to everyone who comes in for information. Post articles on the bulletin board or frame them in the waiting room. Make students feel good about your school. 8. Raise money for charity. Not only do you help a good cause, you get plenty of free, positive publicity and exposure. Hold a kick-a-thon, do a demonstration, have a break-a-thon or think up your own exciting charity event. 9. Submit press releases to the local newspapers about a noteworthy event at your school or a human interest story. Did you get promoted to a higher rank? Do you have twenty junior black belts? Did your students compete in a tournament? These are all news. Tell someone in the media about it. 10. Give a free self-defense or fitness seminar at your school. Invite members of the public and students’ family members to participate. A seminar gives them the chance to see your school and have a very positive introduction to what you teach. Don’t forget to invite the local newspaper. 11. Offer a class at lunch time, mid-afternoon, pre-dawn or late evening. People who cannot arrange their schedule to attend evening classes at other schools in the area will be excited to find a convenient class and you will establish a unique market share.